At Pompeii3, you're able to search a huge unique collection of vintage rings and classic rings. All of our rings are hand made in USA; and each ring has its own, diverse quality Most of rings are fully customizable in platinum, 14k or 18k, yellow gold, rose gold, and white gold. Whatever the occasion, you are bound to find a ring for less than any other store, shop the source and save! Pompeii3 has many types of diamond and gemstone wedding rings. Our most popular are round diamonds prong set in solid 14k white gold. The classic high polished diamond eternity ring is a great look to accent your diamond engagement ring, or simply wear alone. If you're an everyday mother that wants a nice ring that is functional than no need to look further checkout our 1 - 1 1/2 carat diamond eternity ring collection. Wedding bands are available in almost any metal type, such as white gold, yellow gold, rose gold, platinum, and palladium. Pompeii3's rings are a wonderful gift for any occasion. You can select from many types of vintage and antique ring designs. If you're looking for a more subtle classic look check out our plain bands or prong set diamond eternity stackable rings. A more unique approach would be our vintage diamond collection that features milgrain and hand engraved accents. Morganite gemstone rose gold diamond fashion rings are becoming increasingly popular. Morganite has a unique look and being worn more and more by red carpet celebrities. You can't go wrong with diamonds, there is always an occasion to dress them up or down. 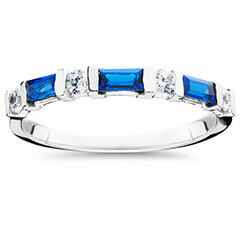 Celebrities love wearing stackable rings because the more you add the more "wow" factor you get, but you don't have to be a celebrity to LOVE get attention with our blue diamond, black diamond, and white diamond rings. Wedding bands for centuries has symbolized the commitment of love between two people. The exchange of rings dates back to ancient Rome. The exchange of rings made of precious metals such as gold and platinum deepened your love and made the ceremony official. This everlasting bond assists in the lifelong journey that you and your partner are going to embark on. The bride and groom exchange wedding bands during the ceremony. 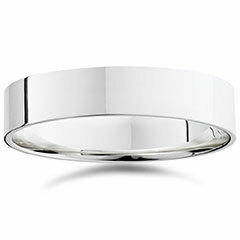 Pompeii3 manufacturers all of their own wedding bands and has no made it easier than ever to select the item you’re looking for with our filtered navigation. You can select gender and then metal to help pick the perfect rings. Pompeii3 can make any style in any width in any metal. 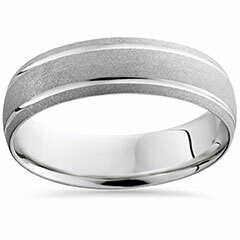 Hammered wedding bands are this years most popular style. 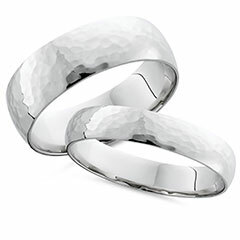 Renew your vows, or make a promise with our wedding bands, gold wedding bands, platinum wedding bands, brushed wedding bands, diamond wedding bands, or matching his hers comfort fit wedding bands. Everyone's preferences are different, Pompeii3 offers a customization feature. We can almost any of our diamond rings in any metal or diamond clarity you prefer. VS clarity is stunning and available on any diamond ring style. Upgraded clarity will accent nicely with gemstones and give the ring more 'pop". Upgrading clarity or metal type to any ring will make it your own and guaranteed to be eye catching. 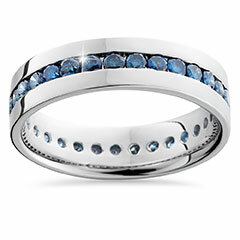 Eternity rings feature diamonds that encircle the entire band. Eternity rings symbolize the circle of life and endless love shared between two people. Diamond eternity rings are commonly used for wedding bands, however they’re becoming increasingly popular as fashion or stackable guard bands. Diamond eternity rings come in different styles. Modern eternity rings are generally channel set, and traditional rings are usually prong set. 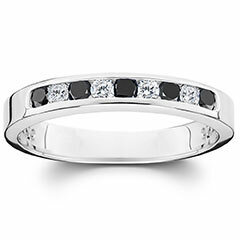 Prong set diamond eternity rings will show the diamonds off more than channel set. Rose gold has become this year’s most popular metal, the edgy and fashion forward metal looks great stacked with a white gold engagement ring or multi tone ring. 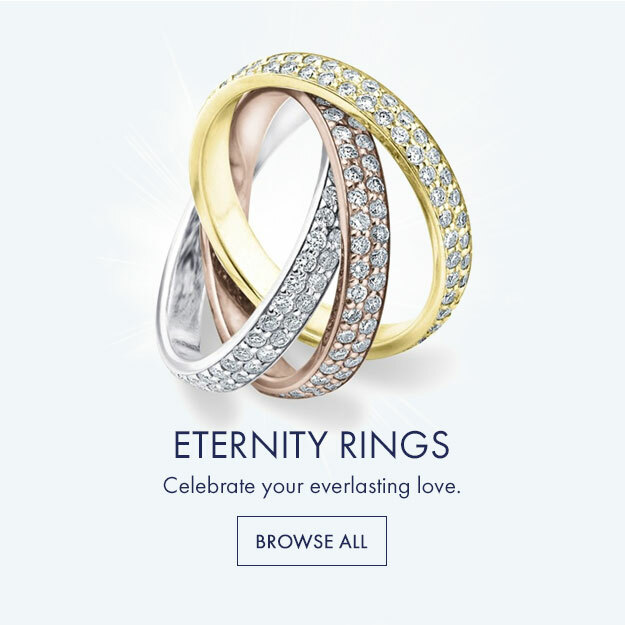 Eternity rings know no end and proudly display your commitment. Shop pompeii3’s larger selection listed in different metals and qualities. 14k diamond rings are forever. Diamond anniversary and diamond eternity rings are classic. Diamond rings are practical and can be switched up with different outfits. At pompeii3.com we dozens that are affordable and wont break the bank. From princess cut diamond rings, channel set diamond rings, mens diamond rings, wedding bands, diamond eternity rings, milgrain vintage diamond rings, to sapphire diamond rings we have it all. Shop the source! 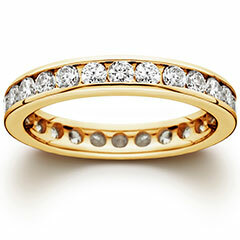 Diamond eternity rings are commonly used as womens wedding bands, stackable rings, and anniversary gifts. Diamond eternity rings come in different sizes, shapes, and qualities. Our collection has single and double rows that encircle the entire finger. Designs are simple to elegant can be matched with an engagement ring or worn alone. When you select a diamond eternity ring, something things to think about are the size and clarity. Our most popular diamond eternity rings are common prong set and channel set. Other unique styles we have our the pave diamond set eternity rings, milgrain diamond eternity rings, and u shape diamond eternity rings. 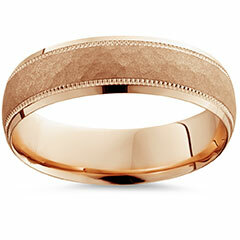 Rose gold diamond rings are trending with the trend shifting from yellow gold. We see rose gold to be the new yellow gold. 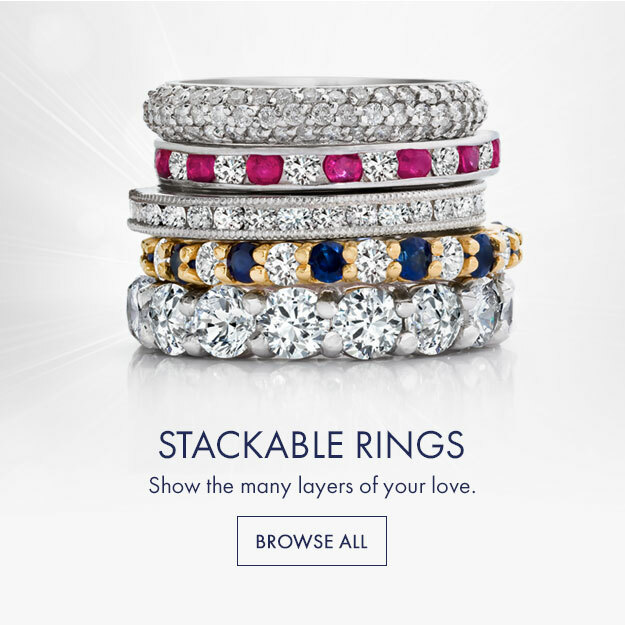 It looks great stacked with other stackable wedding bands. Another great option is to stack a rose gold channel set diamond ring with your diamond engagement ring. Pompeii3 has a unique 3/4ct vintage style rose gold diamond wedding ring prong set under $400. 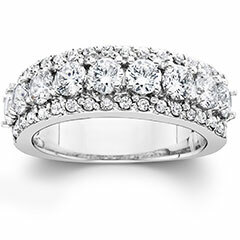 Pompeii3 custom makes all of its diamond eternity and womens diamond wedding rings. Our items are unique, handmade and beautiful. We are the only company that makes its rings to order and ensure the carat weight is the same for all finger sizes. Our diamond eternity ring collection is huge and wildly popular we mix it up with black diamond eternity rings, blue diamond eternity rings, micro pave diamond eternity rings, and the fashion forward black gold black diamond eternity ring. Be popular and unique shop the source today. Stack them up! We offer vintage diamond stackable eternity rings with milgrain and filigree. You can stack the diamond eternity rings in white gold, rose gold, yellow gold, and platinum. Add two or three to give your finger the "wow" factor it deserves. 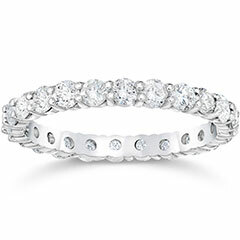 Our most popular stackable diamond eternity ring is 1.00ct and costs approx $449.